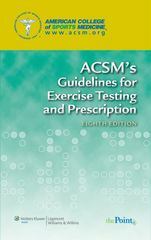 ACSM's Guidelines for Exercise Testing and Prescription 8 Edition The single most internationally read and referenced text in sports medicine, exercise science, and health and fitness, this manual succinctly summarizes recommended procedures for exercise testing and exercise prescription in healthy and diseased individuals. This gold-standard text is a convenient, one-stop resource for the knowledge, skills, and abilities (KSAs) that must be mastered by candidates for all ACSM certifications. Written by international experts in numerous fields, the Eighth Edition is fully compatible with newly released physical activity guidelines from the United States Department of Health and Human Services and state-of-the-art, research-based recommendations. A companion Website for instructors will offer a test generator, an image bank, PowerPoint slides, and a WebCT/BlackBoard-ready course cartridge. A student Website will offer the fully searchable text.